Over the holidays, we visited family on the East Coast. As typically happens with the holidays and family (at least in my experience), lots of eating is involved. We ate our way through New York City, nibbling on Cronuts, fantastic sushi, and even took a food tour through Greenwich Village. However, there was one meal in particular that I was excited to recreate when we returned to the bungalow. On a very cold New Year’s Day, tired from our travels and the previous night’s festivities, we sat down to a beautiful soup that restored our health in a particularly lovely way. Upstate at my mother-in-law’s snowy country house, Ken’s soup was exactly what I needed in that moment. The broth-y, garlicky mix of smoked Spanish chorizo, diced tomatoes, and wilted baby spinach slowly warmed me from the inside out, breathing life back into my cold, tired body. The soup is Andalusian in origin, a peasant-style combination of what was on hand during cold winter months (maybe minus the fresh baby spinach! thank goodness for modern times, right?!). Spanish chorizo is more like salami than the crumbly Mexican chorizo that is more common in Southern California. 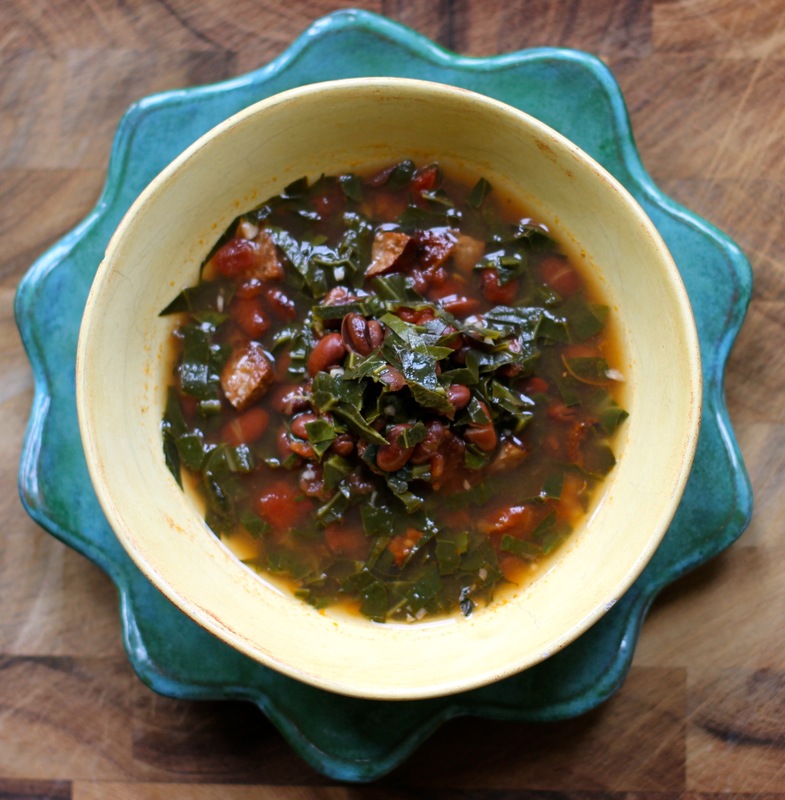 The chorizo lends a rich heartiness to the broth while wilted baby spinach bob around, silky and bright. The sweet, acidic tomatoes were a perfect counterpoint to the spicy sausage. Served with crusty bread, I could not help but lift my bowl to lap up every last drop. When we returned to the West Coast, I could not stop thinking about this soup. Los Angeles is (obviously) much warmer than upstate New York, but the bungalow can be drafty in the winter and I was craving something warm and healthy. I decided to use Ken’s soup as inspiration and make my own southern-style version using Andouille sausage and collard greens. Andouille is what most people know as Cajun sausage, the flavorful smoky sausage that shows up in gumbo, jambalaya, and so many of my favorite dishes in Louisiana. I had some reddish, kidney-style beans in the pantry, so I decided to incorporate them into the mix, along with the tomatoes for sweetness and acidity. The result was equally as satisfying as the original, rich and broth-y and full of greens and beans and smoky bits of sausage. It was crazy good! I loved it. My husband loved it, and we ate bowl after bowl for almost every meal until it was gone.